Truckers Toy Store is the place to go! 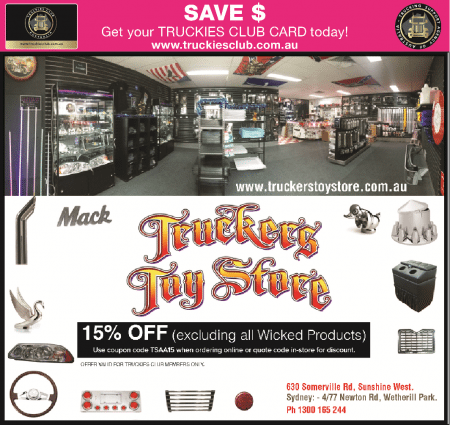 TSAA welcome Truckers Toy Store on board as our newest partners! Sun visors, bug deflectors, LED lights, exhaust shrouds, headlight panels, air cleaner covers, truck antennaes, truck cleaning products, and a whole lot more! Novelty items like chrome accessories, hood ornaments, stickers, decals and flags, mini truck speakers, and more! Australia’s principal distributor of LED vehicle lights and globes. All Chrome Shop products are manufactured under licence and come with a lifetime guarantee. Products are delivered swiftly worldwide and our lifetime guarantee sets us apart from all competitors.